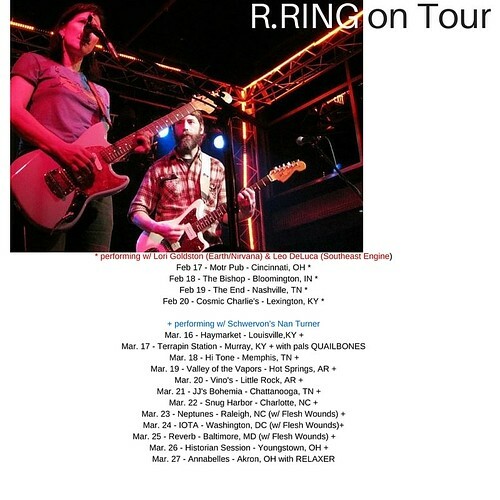 Nan on Tour with R. Ring (Kelley Deal, Mike Montgomery) | Schwervon! Schwervon! is taking a break for a couple of weeks so Nan can go on tour playing drums for the Ohio based band R. Ring (Kelley Deal, Mike Montgomery). Schwervon! has played a few shows opening for R. Ring and they are a true joy to experience. Check out their tour dates below. If they happen to be anywhere near you please check ’em out! This entry was posted in Uncategorized and tagged Kelley Deal, Nan Turner, R. Ring. Bookmark the permalink.